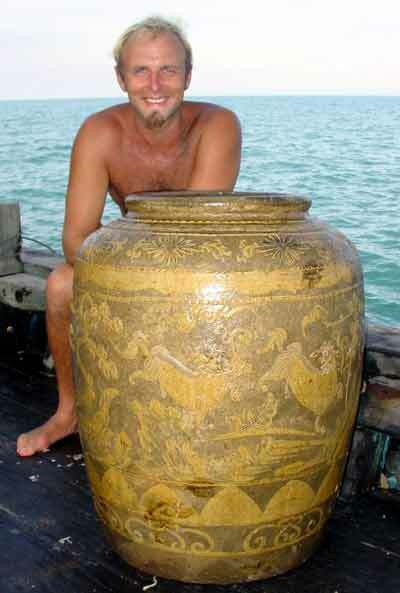 One of nine Shanghai storage jars on the deck of the recovery vessel. The 'Desaru ship' is a Chinese vessel which sank in the 1840s with a cargo of Chinese ceramics. The name relates to the town of Desaru near which the wreck was found, in the southeast of Johor in Peninsular Malaysia; the original name is unknown. The blue and white porcelain found on the ship is attractive, but the quality does not match that found on the Diana (1817) or the Tek Sing (1822). Once-meaningful motifs had become progressively debased over the centuries until no longer recognisable. The many large and crudely-potted storage jars suggest that cheap practical objects were in higher demand than decorative objects or wares for fine dining - although the discovery of over 50,000 soup spoons unmatched with bowls also demonstrates the scale of contemporary trade (the bowls may have been on another ship?) and the danger of extrapolating too much from a single cargo. The Desaru ship was divided into lateral wooden compartments, between which the cargo was stacked with no trace of boxes or other packing material surviving, except that some of the storage jars contained smaller ceramics. The wreck lay almost flat on the seabed, with the lower part of the hull, the compartments, and some 90cm of cargo (the height of two layers of storage jars) well preserved. The ship is estimated to have been around 30m long and 8m wide - which is narrow for a cargo vessel - and carried no ballast other than the ceramic cargo, so may have been somewhat unstable. Some aspects of construction, particularly the lack of large bolts and of support for the ceiling boards, appear slipshod. The square bow and the mast step for the main mast are structurally interesting. Artefacts from the Desaru ship are on display at the Maritime Archaeology Malaysia exhibition at Muzium Negara, Kuala Lumpur. This web report is based on 'The Desaru shipwreck excavation: final report' by Sten Sjostrand, submitted to the Malaysian Department of Museums and Antiquities in January 2003.